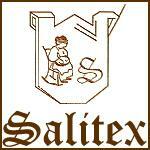 Specialized in the production of hand-embroidered household linen, Salitex has been present for 30 years. Our designs and custom made creations in fine fabrics of linen, cotton and natural fibers finely embellished with custom finishes that combine physical welfare and aesthetic qualities to the spiritual pleasure. "... Those who find beautiful meanings in beautiful things are cultivated"